AIDS service organizations, health departments, and universities across the country are using these low cost, high impact condom dispensers to distribute free condoms in bars, restaurants, retail locations, clinics, and on campuses. Available in two sizes, these condom dispensers were perfected over an 2-year period of development and field-testing by the AIDS Fund, a globally recognized non-profit organization. 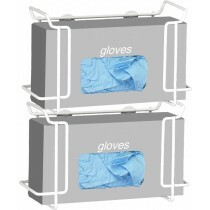 The small condom dispenser holds approximately 250 condoms and the large condom dispenser holds about 700 condoms. 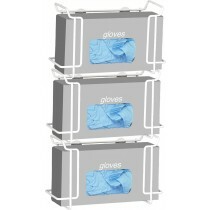 They are easily filled through a hinged lid. The condom dispensing opening at the bottom allows patrons to pull a few condoms at a time to discourage people from grabbing handfuls. 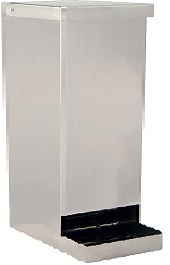 These condom dispensers are made of high-impact mild steel or stainless steel. These sturdy condom dispensers will stand up to many years of use even in harsh venues like bars and restrooms. While the condom dispensers are a great way to prevent infections by distributing free condoms, the unique design was created with education in mind too. The condom dispenser's flat face allows your organization to create and attach a prevention message, including your organization's logo, web or phone data, QR code, and information on how-to-get tested. Now in their 3rd generation of production, these condom dispensers were updated in 2013 with new features based on continual field-testing and customer feedback.